On Friday my little guy will be 6 years old. SIX. YEARS. OLD! I swear it was just yesterday that I was looking into this little face…. Now my little guy is growing up and I CAN’T STOP IT!!!! Caleb LOVES banana bread. He asks to have it for breakfast every single morning. He likes to tell me that if I can have salad for dinner every single night that he can have banana bread for breakfast every single day. His logic astounds me sometimes! We’re having a joint birthday party for both my kids a week after his birthday (Keegan’s birthday is 12 days after Caleb’s and we tend to combine the parties as they share most of their friends) but I wanted him to have a special treat for his big day so I merged his favorite bread with his favorite treat! I made these cupcakes in my mini cupcake tin and they were fabulous. Caleb would put a chocolate coating on everything so coming up with a chocolate frosting was a must! We all loved these little cupcakes. I now get asked to have banana cupcakes for breakfast everyday! Even if you’re not celebrating a birthday these are a fun treat to have for breakfast or dessert. Enjoy! 2. In a large bowl add in the flour, coconut crystals, baking powder and soda. Mix well and set aside. 3. Place the milk, 1 tbsp vanilla and bananas in a small saucepan over low heat. Once the mixture is just slightly warm add in 3 1/2 tbsp coconut oil. Stir continuously until the coconut oil is completely melted. Set the mixture aside and let it cool down to room temperature. 4. Add the wet ingredients to the dry ingredients and mix together. Do NOT over mix. 6. Lightly spray your cupcake tin with olive oil. 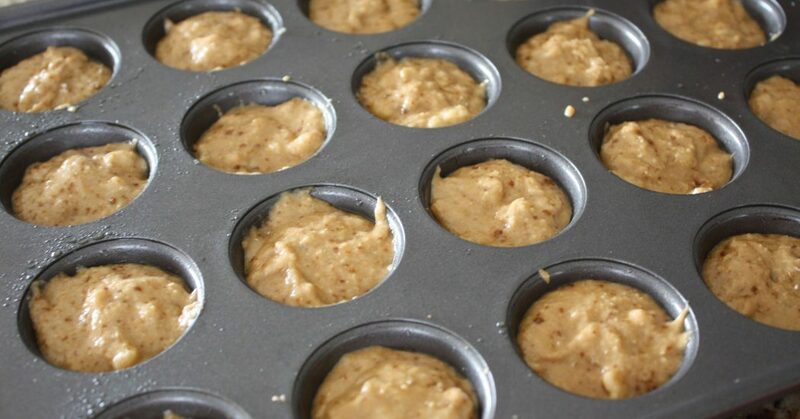 Fill each cupcake mold about 3/4 full with the batter. 7. Place the cupcake tin in the oven and bake for 12 minutes for mini cupcakes and about 18 minutes for regular sized cupcakes. Your cupcakes are done when the tops bounce back when you press down on them. 8. While your cupcakes are baking add the chocolate chips, 1 tbsp coconut oil, honey and 1/2 tbsp vanilla to a small saucepan. Cook over low heat until melted and smooth. Remove from heat and let cool to room temperature. 9. Remove your cupcakes from the oven and let cool for 2-3 minutes. Over a piece of wax paper or even paper towel, turn your cupcake tin over and gently pat the back. Your cupcakes should pop right out. Continue to let your cupcakes cool to room temperature. Make 32 mini cupcakes or 15 regular sized cupcakes. Serving size 2 mini cupcakes or 1 regular cupcake. 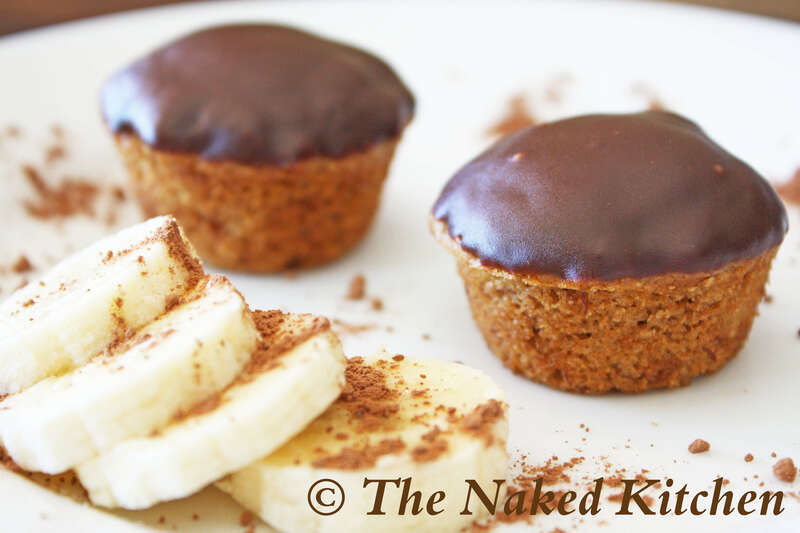 If you want to make these cupcakes gluten free simply replace the whole wheat pastry flour with brown rice flour and use a gluten free chocolate chip for the chocolate sauce. The cupcakes will keep for 2 days at room temperature and up to 1 week in the fridge. What do you think could replace the coconut crystals? You can replace the coconut crystals with any type of ‘sugar’ product. The only other product I use is date sugar and I know that it works in this recipe. Other popular, but not equally as healthy products would be sucanat or justlikesugar.